Nominations for CalSPRA's Open Secretary Position Now Open! Hello CalSPRAns: Nominations for CalSPRA’s open Secretary position on the Executive Board are now open! The newly elected Board member will serve as Secretary for two years, then President-elect, President, and Past President each of the following three years. Please read this entire message carefully for instructions, timelines, and additional details. WHO CAN NOMINATE? Self-nominations and nominations on behalf of others will be considered. NOMINATION DEADLINE: 11:59 p.m. PST Friday, March 22, 2019. You may edit your nomination questionnaire up until the deadline. WHAT HAPPENS NEXT: Nominees will be reviewed by the CalSPRA Nominating Committee, which consists of the Immediate Past President and two other CalSPRA members who have not served on the Executive Board in the past two years. The nominating committee will consider the needs of the organization, discuss nominated candidates’ potential for office, contact potential candidates to confirm interest and ability to serve; and prepare a slate of officers from among candidates whose qualifications meet those outlined inCalSPRA Bylaws Article VII. WHEN’S THE ELECTION? The final slate of candidates’ names and spaces for write–in candidates will be e-mailed to all eligible members the week of March 25, 2019. QUESTIONS? Contact CalSPRA Immediate Past President Manny Rubio at manuel.rubio@sweetwtaerschools.org or (619) 691-5578. Join Us in San Diego for a One-Day Regional Workshop on The Key to Powerful Leadership Communication! 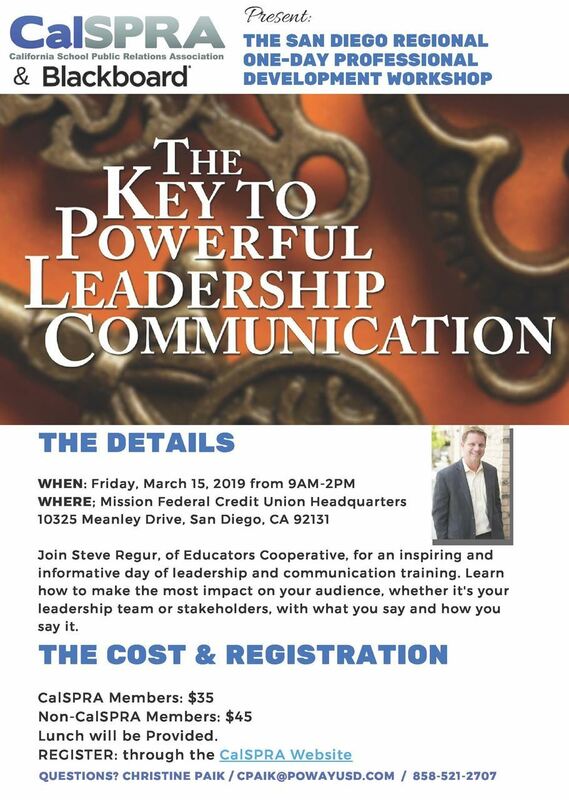 Join Steve Regur, of Educators Cooperative, for an inspiring and informative day of leadership and communication training. Learn how to make the most impact on your audience, whether it’s your leadership team or your stakeholders, with what you say and how you say it. Steve will dive into different communication styles and how to leverage that knowledge when it comes to working with and leading others. Sponsor Blackboard will also present a case study on how school leaders were able to build trust and confidence in their leadership after successfully communicating during a recent crisis. Registration Open for 2019 CalSPRA Seminar! We are so excited to announce that registration is now open for our annual seminar in 2019! As you know, we switch locations from north to south every year, so we are heading north for 2019. As some of you may have heard, we have selected Santa Rosa as our seminar location. This city is still recovering from the devastating wildfires in 2017, and we learned that one way to help communities rebuild is to bring tourism dollars to help the local economy. CalSPRA is proud to be able to help in this way, and we hope you will join us in this effort. We have selected dates that also give us the best possible rates as we understand how important this is to our membership. Our seminar will be February 25-27, 2019. Early travelers can book the conference rate starting on Sunday night, and the rate does carry through Wednesday night as well. Hopefully you can come in early or stay longer to enjoy all that beautiful Sonoma County has to offer. We have many exciting things planned and we will be updating you regularly about programming, keynotes and awards in the near future. For now, registration for the seminar and hotel rooms are open so please visit here to register today! The California School Public Relations Association (CalSPRA) wishes all of you a happy new school year! Thank you for your continued involvement in the CalSPRA organization. Without you, the organization's commitment and support of public education would not be possible. We know that you've been eager to send in your membership for the school year and are excited to inform you that the 2018-19 CalSPRA Membership Drive is now open on the CalSPRA website. CalSPRA is growing faster than ever and in order to provide the best customer service and value to members, we are embarking on a new membership platform. In this platform, we encourage you to register online as it is the quickest way to jumpstart all of the membership perks. Once registered for membership, you will be asked to complete an online profile, including photo, to help develop a comprehensive membership directory that will be available on our website and, in the near future, our new app! Renew your membership to ensure you retain access to the Listserv, a "lifeline" for daily networking and mentoring with colleagues from across the state; access to the Annual Excellence in Communications Awards program; networking with superintendents, communications, educators, and industry thought leaders; discounts to member networking and professional development events; and access to the members-only resources on our website. CalSPRA membership also gets you reduced registration fees at various events, including our annual conference. Planning for the 2019 CalSPRA Annual Seminar & Awards Banquet in Santa Rosa is underway, so stay tuned for more information very soon! Please also take time to review the National School Public Relations Association membership information here and consider investing in your professional future by joining its team as well! We look forward to another successful year in CalSPRA! Please do not hesitate to contact us with any other questions or concerns at caschoolprassociation@gmail.com. Welcome to our new CalSPRA Website! Welcome to our new CalSPRA website! We hope this change will allow our members easier registration, a more comprehensive member directory, and much more! We look forward to expanding this site to offer our members the resources and support they need to be the best school communicators in the country! This year, the CalSPRA board recognized two individuals as part of the annual Excellence in Communications Awards. These special recognitions for leaders in our field honor one person who is newer to the profession and one who is a veteran. School communications professionals from the New York School Public Relations Association judged the individual awards. The Emerging Communicator award is intended for a school communications professional with 1-4 years’ experience, who already has demonstrably contributed to the profession and is expected to continue advancing the profession. The Communicator of the Year award recognizes a school communications professional with five or more years’ experience in school PR, who has distinguished professional accomplishments, service to CalSPRA, and service to the profession. The 2017-18 Communicator of the Year is Tim Herrera, communications director for the Sacramento County Office of Education. There were a whopping four letters of nomination suggesting Tim for this award. Tim is a seasoned professional with experience in communications, journalism and media relations, able to effectively communicate positions and policies. He’s an effective problem solver with excellent written, verbal communication and leadership skills who has extensive experience in all aspects of media thanks to previous work as a radio reporter and news director, television reporter and anchor, newspaper columnist and author, and now as a communications specialist. In addition to his gig as communications director, Tim is an adjunct instructor for Penn State World Campus and National University. He’s the author of 10 books. Tim holds a BA in journalism from Penn State and a Master’s in Strategic Communications from National University. The 2017-18 Emerging Communicator of the Year is Sara Sandrik Goins, public information officer for the Merced City School District. Sara has presented at past CalSPRA events and regularly collaborates with her Central Valley peers. She came to school PR from the TV news world, having anchored weekend newscasts for Central California’s ABC30 and reporting during the week. Before moving to Merced, she worked at KYMA in Yuma, Arizona and KGO-ABC7 in San Francisco. Sara attended Stanford University and graduated with honors with a major in American Studies, a focus in Policy, Politics, and Economics, and a specialization in Race and Ethnicity.